It's like a scene right out of a movie. In fact, it pretty much is. Guests enter the new Savage Lounge a la Goodfellas, through the kitchen of Midtown restaurant Pomona (8 W 58th St). The speakeasy is not just a place to drink, DJs spin late into the night at the black-and-white 120-person cocktail bar. 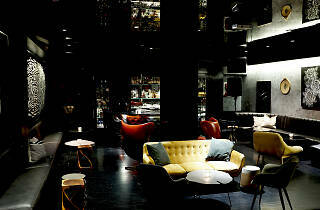 Inside, there is a black lacquered bar surrounded by leather banquettes and two custom art installations that include an oversized pair of thumbprints of Pomona’s chef Michael Vignola. There are also pieces from a rotating roster of artists, all of which are available for sale. 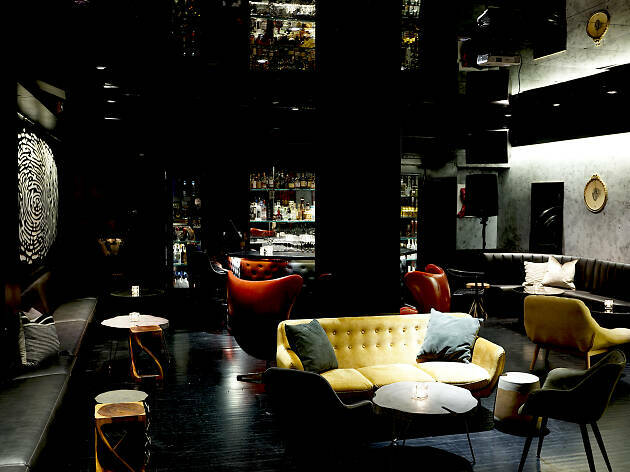 You can stay for a chill cocktail or to get your groove on, as the DJ will spin everything from deep house to top 40 starting at 10pm. Pad your belly with light bites like baked oyster with chile bacon, chicken wings with black truffle and king crab with Old Bay funnel cake and charred avocado. Inside the inside is a private dining room set up with living room furniture, including a bookcase that doubles as a secretive entrance into the lounge. And just so you know, the space was formerly Beautique, where Drake and Leonardo DiCaprio used to hang out.